Q1. What information is held in the topology table? Answer: The topology table holds a map of every link in the area. Every topology table in the area is the same. This is sometimes referred to as the link-state database. Q2. What command is used to manually determine which router on a LAN will become the DR? Answer: The priority command is used to manually determine the DR. The higher the priority, the greater the likelihood is of success. Q3. What details are used to determine the metric of a route in OSPF by default on a Cisco router? Answer: The bandwidth is used to determine the default cost or the value of the path with the lowest cost. Q4. It is possible to have more than one OSPF process on a router—how would this be achieved? Answer: The router command creates the OSPF process with an ID number to identify it. To create another process on the same router, issue the same command again with a different ID number. There are design issues to consider, and this configuration should not be implemented lightly. Q5. Which RFC identifies the use of OSPF over an NBMA cloud? Answer: RFC 2338 explains the use of OSPF in a point-to-multipoint and NBMA environment. Q6. State the different types of packets used to build a routing table for the first time. The Hello protocol—This is used to find neighbors and to determine the designated and backup designated router. The continued propagation of the Hello protocol maintains the transmitting router in the topology database of those that hear the message. The database descriptor—This is used to send summary information to neighbors to synchronize topology databases. The link-state request—This is a request for more detailed information, which is sent when the router receives a database descriptor that contains new information. The link-state update—This is the link-state advertisement (LSA) packet issued in response to the request for database information in the link-state request packet. The link-state acknowledgement—This acknowledges the link-state update. Q7. In creating an adjacency, what is the exstart state? Answer: The exstart state is a stage in the forming of an adjacency between neighbors. This stage is the stage when the DR and the BDR have been elected. The master/slave relationship has been established, as has the initial sequence number of the DDP packets. Q8. Explain the command ip ospf network non-broadcast. Answer: The ip ospf network non-broadcast command is the RFC-compliant mode for NBMA. It is the default mode for interfaces and point-to-point subinterfaces. It is used in a full or partial meshed network, and OSPF operates as if on a nonbroadcast network. It is necessary to manually define the DR to be a hub router that is connected to all the other routers. Neighbors must be defined manually. Q9. In which of the NBMA configuration choices is it necessary to manually state the neighbors? Why is this necessary? Answer: It is necessary to manually configure the neighbors in the industry-standard NBMA mode and in the Cisco point-to-point nonbroadcast mode. It is necessary to define the neighbors to the network because the network believes that it is a nonbroadcast medium, so it cannot send out the multicast traffic to ascertain the neighbors. Q10. In a Frame Relay environment, which is fully meshed, which OSPF configurations might be chosen? Give reasons for your choice. Answer: The industry-standard NBMA configuration may be chosen in a fully meshed environment. It requires an additional manual configuration of the neighbors, but the network will elect the DR and the BDR. There may be some design concerns about running this mode in an unstable network, which could burden the CPU and the WAN links. It is possible to use point-to-point subinterfaces without worrying about the OSPF network type because they will become neighbors. The other alternative is the Cisco broadcast mode, which does not require the manual configuration of neighbors. Q11. How often by default does OSPF send out hello packets on a broadcast multiaccess link? Answer: By default, OSPF sends out hello packets every 10 seconds on a broadcast network. Q12. What is a neighbor in OSPF? Answer: A neighbor is a router on the same network link. Q13. What is an adjacency in OSPF? Answer: An adjacency is the state that two neighbors can achieve after they have synchronized their OSPF databases. Q14. If the network is stable and sees no changes, how often will it send LSAs? Why are these updates sent out periodically? Answer: If the network is stable, OSPF will still send out LSAs every 30 minutes by default. This is to ensure the integrity of the topological databases. Q15. If a router has an OSPF priority set to 0, what does this indicate? Answer: A router with the OSPF priority set to 0 is one that cannot participate in the election of a designated router. It can become neither a designated nor a backup designated router. Q16. What does NBMA stand for? 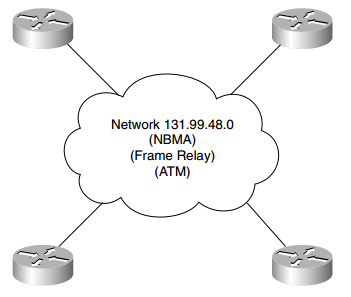 Answer: NBMA stands for nonbroadcast multiaccess. Q17. RFC 2328 describes the operation of OSPF in two modes across an NBMA cloud. What are they? Answer: The two modes of operation across a NBMA cloud as described in RFC 2328 are nonbroadcast multiaccess and point-to-multipoint. Q18. The Cisco solution point-to-point mode does not require the configuration of DR and BDR. Explain briefly why. Answer: The Cisco solution point-to-point does not require the election of either a designated or a backup designated router because there are only two nodes on the network. They will form an adjacency directly. Q19. The address 192.100.56.10 has been allocated to an interface on the router. This interface alone is to be included in the OSPF process. State the command that would start the process on this interface. Answer: There are several ways to configure the process to include the interface. The command network network number wildcard mask area area number would be a subcommand to the global command router ospf process-id. The network command is used in both possible solutions; the difference is in the wildcard mask. network 192.100.56.10 0.0.0.0 area 2—This will match every bit in the interface address. network 192.100.56.10 0.0.7.255 area 2—This will also match the interface because it will resolve to the subnet assigned to the wire connected to the interface. This bit allocation was chosen merely to demonstrate the technique. The allocation assumed is the subnet mask of 255.255.248.0. Note that the wildcard mask is the inverse of the subnet mask, ensuring that the individual subnet is selected for the interface. Q20. What command would identify the designated router for your LAN? Answer: The command show ip ospf interface shows the designated and backup designated routers. Q21. The metric used by OSPF is cost. How would you change the default setting on an interface? Answer: Underneath the appropriate interface, issue the command ip ospf cost cost. The value for cost is an unsigned integer value expressed as the link-state metric. It can be a value in the range 1 to 65,535. Q22. If the command ip ospf network non-broadcast is used, what additional statement is necessary? Answer: If the command ip ospf network non-broadcast is used the additional statement that is required is the neighbor statement. Because the network is a nonbroadcast network that cannot see its neighbors, they are to be manually configured. Q23. What command shows which router on a LAN is the BDR? Answer: The show ip ospf neighbor command will show the designated router and the backup router. Another command that will show the designated router is the show ip ospf interface command. Q24. Explain briefly what show ip ospf database will reveal. Answer: The command show ip ospf database shows the contents of the topology database and gives a status on the LSAs that have been sent and received, including how long it has been since the last LSA was received. Q25. What command is used to show the state of adjacencies? Answer: The command show ip ospf interface shows the adjacencies that exist with neighbors. Q26. It is possible to have more than one OSPF process on a router. Which command would achieve this? Answer: It is possible to have more than one process, although it is rarely configured. The process ID in the command router ospf process id not only starts the process, but it also identifies the process; repeating the command with another ID number will create another process. One possible scenario for this configuration is at a service provider that wants to separate its OSPF domain from its customer.